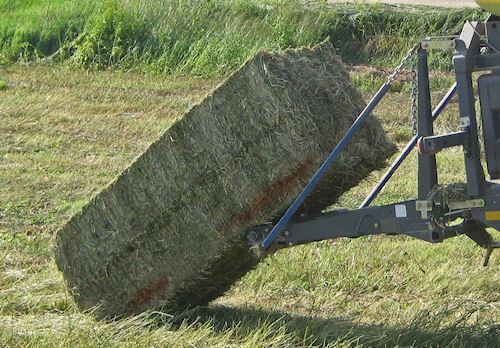 Harvest Tec offers on-the-go haymaking information and high-moisture bale marking. Harvest Tec's new 500 Series Automatic Applicator gives hay makers on-the-go readings of baling rate for big round bales or stroke counts for each bale on small square bales. The new 500 Series is capable of downloading baling records via USB ports, and can store data for up to 300 job records, including individual information on as many as 32,000 bales. These records can be downloaded to a memory stick and managed in a spreadsheet on the office computer. A new automatic marking system from Harvest Tec allows hay makers to see portions of bales that exceed a preset moisture level. Data collected with the 500 includes an identifying num ber for each bale, date and time it was baled, the field from which the bale originated, average and high-moisture of thst bale, and the amount of preservative used. The new system also works with fixed chamber round balers. In addition, Harvest Tec has introduced a new sprayer marking system that applies red food-grade dye to show any sections of high moisture hay in small or large square bales. The marking system works hand-in-hand with the new 500 Series Application systems, and allows anyone handling the baled hay to visually sort it for feeding and storage purposes. The moisture level at which dye is applied can be adjusted from 8% to 76%, and the dye can be applied to the top or both sides of the bale. For more information on the new 500 Series Applicator, or the marking system, call (800) 635-7468, or visit www.harvesttec.com.